I went to Renee's Kitchen and asked what she thought was the best tasting recipe for brownies. She gave me this one that she got from the Internet, insisting it was really good. As a brownie lover, I had to try this for myself. The result was one of the best tasting brownies I've ever had. 1) In a small bowl, whisk together the flour and salt, then set aside (1). 2) Melt the butter and chocolates together on top of a double boiler over (but not touching) simmering water (alternatively you can use a metal bowl over a pan of simmering water) (2) Stir frequently. 3) Once melted and smooth, add 1 cup of the sugar to the bowl and stir for about 30 seconds. Remove mixture from heat and stir in vanilla extract (4). Pour this mixture into a larger bowl. 4) Put remaining 1 cup of sufar and the eggs into a medium bowl and whisk together by hand (5). 5) Little by little, pour half the sugar and egg mixture to the chocolate mixture (6). Stir constant to prevent eggs from scrambling from the heat. 6) With a mixer, beat the remaining sugar and eggs on medium speed until they are thick, pale and doubled in volume (about 3 minutes) (7). 7) Gently fold the whipped eggs and sugar into the chocolate mixture (8). 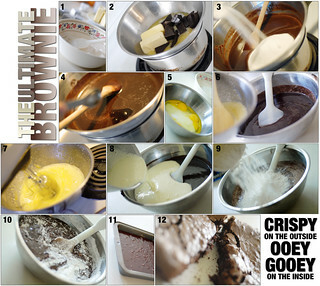 8) When the eggs are almost completely incorporated, gently fold in the dry ingredients (9) and mix thoroughly (10). 9) Pour this batter into an 8" square pan (11). 10) Bake in center rack in oven at 350F for about 25-29 minutes. After about 23 minutes, test the brownie by sticking a toothpick into the center. They should be just barely set but not too raw. Mine took about 29 minutes for the desired consistency. Note: These brownies can keep at room temperature or in the refrigerator for 2-3 days. You can put them in the freezer but they will never freeze solid making them a great snack to eat straight out of the freezer too. The final result should look a little something like this.